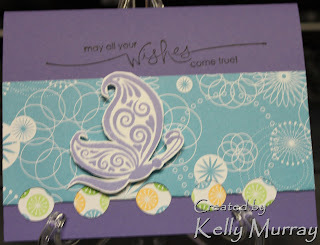 My last card for the workshop this weekend. I learned this new little trick/technique where you punch your slit punch from SU up the full distance of the bottom of the paper and continue to do so along the edge leaving a space between each punched slit. Then fold along the bottom of the punched area. If you have double sided paper the unused side shows the circles along the bottom of the piece. If you use a solid piece of colored cardstock you can slip in a strip of white or other colored paper, you will have semi circles show up. 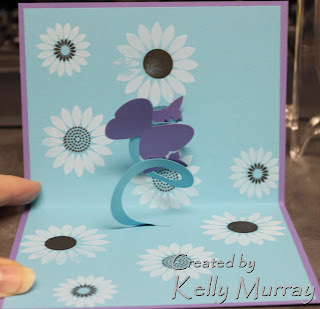 This is my first time making a spiral pop up card but they always looked so fun especially for kids, but we can all be kids at heart.